(Washington Post) -- The Council on American-Islamic Relations, a national Muslim civil rights group that has frequently drawn fire from conservatives, has regained its tax-exempt status. The Washington, D.C.-based CAIR and its related foundation were two of about 275,000 nonprofits that lost tax exempt status last year for not filing tax returns for three years in a row. Last month, the Internal Revenue Service sent a letter to the CAIR-Foundation Inc., saying the nonprofit had regained its tax-exempt status. “We are obviously pleased that all the paperwork issues have been resolved and our tax-exempt status has been restored,” said Ibrahim Hooper, communications director for CAIR. Hooper did not know the details of what paperwork, including tax returns, had been filed. The nonprofit has opposed anti-Shariah law bills across the country, fights discrimination against Muslims and aims to promote a positive image of Muslim-Americans and Islam. 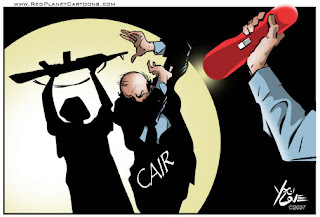 Critics have used CAIR’s lost tax exemption to criticize the group. Those critics also claim CAIR has terrorist ties because it and other Muslim groups were named as unindicted co-conspirators in a 2007 trial of the now defunct Holy Land Foundation in Texas. Holy Land Foundation officials were convicted in 2009 of diverting funds to Hamas.